No Regrets? | sew. quilt. explore. | modern quilting | tutorials: No Regrets? 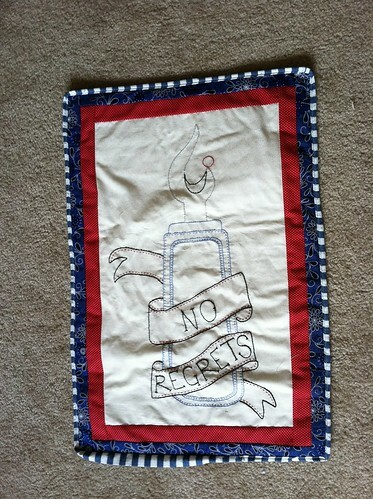 So I finished my embroidery piece I talked about in Weekend Progress, and I set about to set it in borders and binding. I love the red border and the binding but I have mixed feelings about the blue border. Is it too much? Does is throw off the colors? Keep in mind, I'm going to quilt it after I get the binding on, it's so small it won't pucker in between. I started ripping out the binding because I've decided I hate the look of machine sewn binding. (Sorry for those who love it, but the extra time is worth it to me, plus I really like sewing on binding for some reason.) Anyways I started ripping it out because I was about to rip out the blue border as well. Ha, "No Regrets" right? But I stopped myself before I got too far. I need a second opinion. Help. What should I do with that border?